Well last night’s poetry reading at The Bear Town Tap in Congleton went very well. Which is a relief. I’m still lazily reading through my first draft. The intention was to have a leisurely read-through, making the odd note as I went. The above picture is one of a typical page. I am using far more red ink than I intended. 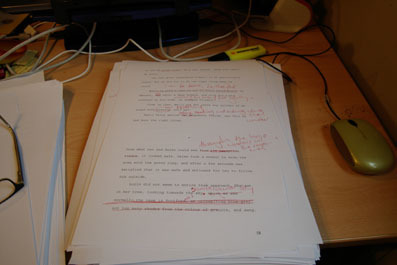 It’s not supposed to look like that until I’m properly redrafting. Maybe my editing process has evolved. And I’d like to draw your attention to this article, written by a fellow WriteWorder – the very talented Trilby Kent. And last but not least – happy birthday Anne. Cheers Anne – me too!